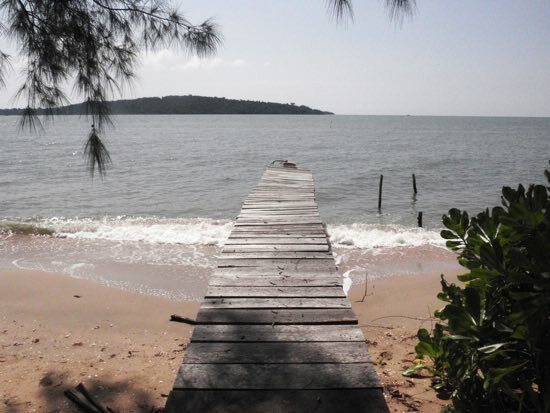 Photo: Sleepy beach on Koh Thmei. 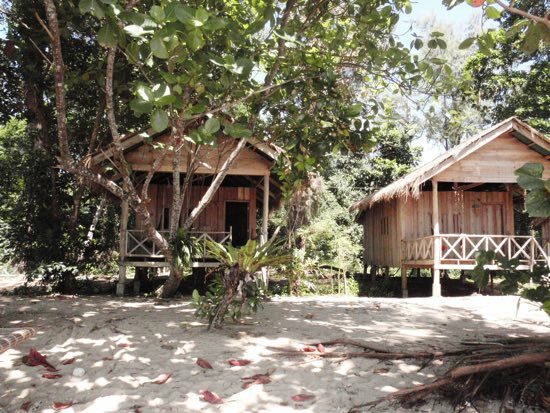 Run by a German couple, Koh Thmei Resort opened in December 2010 and is a relaxing place to spend a few days. The owners greet arrivals at the beach personally and offer a welcome drink and orientation. Bungalows are carefully constructed, with walls of wood and tin roofs covered by thatch for aesthetics. The very clean ensuite bathrooms are tiled, with a separate shower, and are definitely the nicest we’ve seen in this price range. One for you one for me. 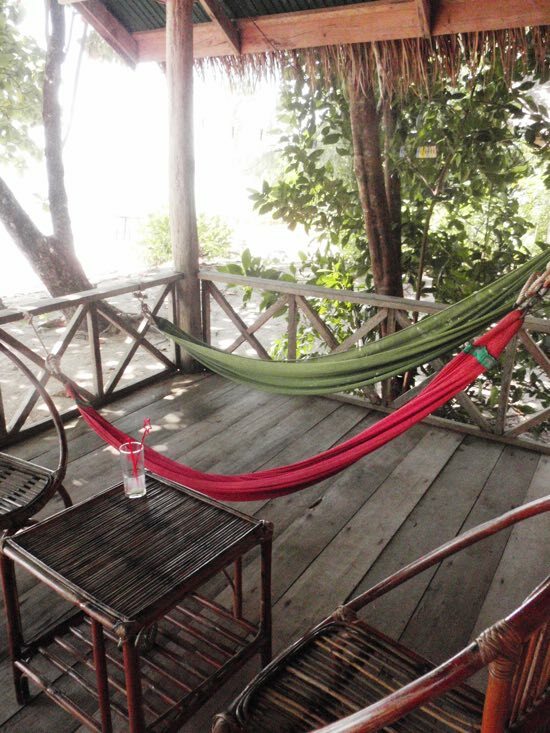 Although the bungalows are close together, each one has its own large balcony hung with seashells and two hammocks at a perfect angle for seaviews. This level of attention to detail is what sets Koh Thmei resort apart; hooks in the bathroom, a washing line with pegs and silk shades on the lamps are often sadly lacking in island accommodation. Books, games, a foosball table, snorkelling gear and a surfboard are all free to guests and a kayak can be rented for $3.50 an hour. Beach towels are provided for free. Power is available around the clock — during the day thanks to solar panels and at night from a generator. The menu is predominantly Khmer but portion sizes are good and prices are reasonable, given the distance from the mainland. They even have draft beer for US$1.25! The bedroom is a room with a bed. The resort is on a yellow-sand beach covered with seashells and flanked by more pine than palm trees. Though lovely, it’s not the very best stretch Cambodia’s islands have to offer, as if we’re being uber critical it’s a bit narrow when the tide comes in on the patch directly outside the bungalows. Sun seekers will need to be strategic about where they place their towel. However, you can walk along the beach in the direction of the island’s exceedingly busy police station — hammocks are strung up inside — or in the opposite direction to a nicer beach. To get to the latter, the sand disappears in parts with the tide en route, though if you’re happy to wade it’s still walkable or reached by boat. You too can pretend to be a Cambodian police officer. Getting to the island is the biggest drama of an otherwise very relaxing stay — a $25 taxi ride from Sihanoukville ($28 from Otres Beach) to Koh Kchhang fishing village which the resort can pre-arrange, or a drop off from the bus from Sihanoukville or Phnom Penh — depending on which way you’re coming from — at Ou Chhmar Village, followed by a 20-minute moto taxi ride. It’s best to call and arrange the $12.50 boat transfer (up to six people) in advance, as there’s little to do in the village apart from drink coffee. The journey feels less like a mission when you get to the water as it’s fun, taking in some scenery rather than merely wide open ocean. It leaves behind a quiet fishing village — also a hub of gasoline smuggling from Vietnam, we’re told — as you then set off through the mangroves. We saw eagles flying overhead, hundreds of snake-like looking fish we’d love to tell you the name of but had never seen before, and then got royally soaked when we hit the open waters as things got choppier heading round the far side of the island to the resort with Phu Quoc in the not-so-far-distance. They have two boats so there is no fixed arrival or departure time; the resort can arrange onward bus tickets. 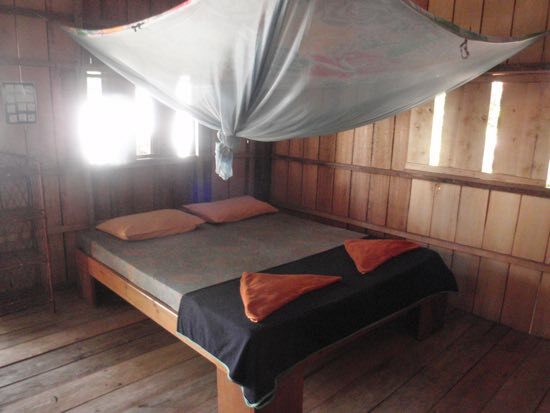 Ticking the boxes for privacy, a truly escape-the-city environment, well-constructed bungalows, decent food, 24/7 power and sandy beaches, the price is reasonable, especially when compared to some of the rates being charged on bigger and more frequented islands like Koh Rong and Koh Rong Samloem. Recommended. 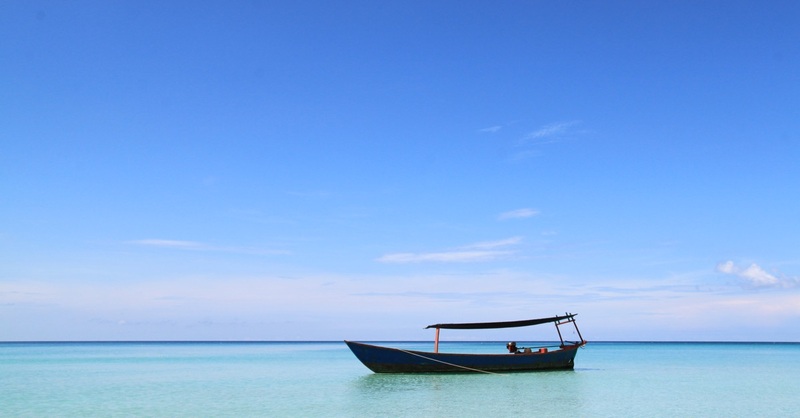 Where are you planning on heading to after Koh Thmei? Here are some spots commonly visited from here, or click here to see a full destination list for Cambodia.